It was another eventful weekend in the SEC as Week Seven featured several upsets and surprises, including Georgia’s first loss of the season and Tennessee’s first SEC win since the 2016 season. After these shake-ups, here are the updated SEC power rankings. Tua Tagovailoa and the rest of the Crimson Tide continue to dominate the competition and separate themselves more and more from the rest of the country. This week Tagovailoa threw for 265 yards and three scores en route to a 39-10 win over Missouri. The only concern for Alabama going forward is the health of their quarterback who left the game after reaggravating a sprained knee. As long as he is okay, Nick Saban’s squad will be hard to stop. The Tigers got the biggest win of the weekend when they beat Georgia 36-16 in a game that LSU dominated the entire time. Joe Burrow continues to manage games effectively, throwing for 200 yards and rushing for 66. The Tiger defense was relentless the whole game and frustrated the Bulldog offense. They have another tough test this week when Mississippi State comes to Death Valley. Jake Fromm and Georgia’s offense got exposed a little bit by LSU on Saturday. The Bulldogs failed to put up any points in the first half and Fromm completed less than 50% of his passes while throwing two picks. The defense was not all that better, allowing 36 points to an average offense. Georgia is still one of the best in both the SEC and in the nation but there are several weaknesses that need to be addressed over the next two weeks as they prepare for a game against the Gators that could decide the SEC East. The Gators definitely looked like they were suffering a hangover from their big win against LSU as they faced an early 21-3 deficit in Nashville. 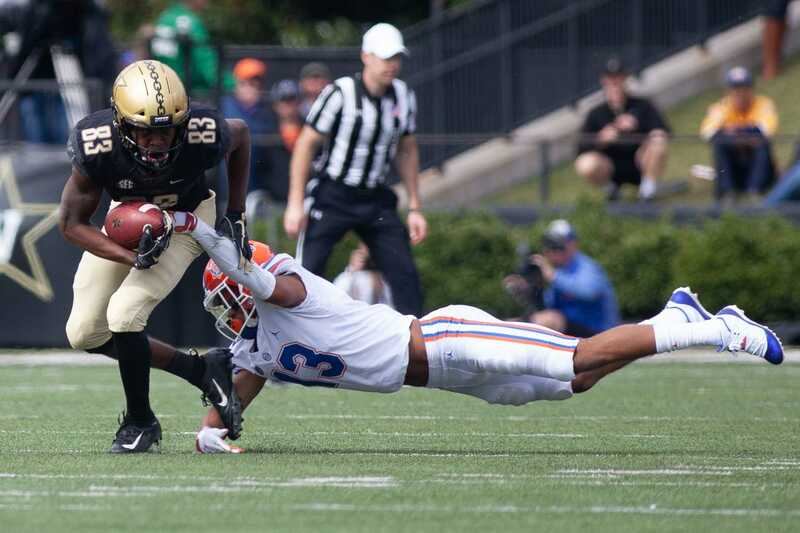 A successful fake punt in the third quarter seemed to switch the momentum to Florida and they came roaring back and outscored the Commodores 24 to six in the second half. The running game was a big reason for the comeback as Florida had two running backs, Jordan Scarlett and Lamical Perine, get over 100 yards on the ground. The Aggies got a close win against South Carolina by a score of 26-23. They were up 13-0 at halftime before allowing the Gamecocks to stage a comeback. Kellen Mond had 353 yards through the air and also tossed a touchdown. The Wildcats were off this weekend after suffering their first loss of the season at the hands of Texas A&M. The Wildcats defense is tough and Benny Snell continues to be the catalyst for the offense and has 699 yards and 8 touchdowns on the ground. Quarterback Terry Wilson will need to be able to make more big plays with his arm if Kentucky is serious about representing the SEC East in Atlanta. After beginning the season as a top-10 team in the country, Auburn currently sits at 4-3 with just a 1-3 record in SEC play. The Tiger offense is seriously struggling and Saturday’s loss at home to a Tennessee team who had lost their past 11 conference games is a new low point for a team that was in the SEC championship just last year. Quarterback Jarrett Stidham has thrown four interceptions to just seven touchdowns. The Tigers have a much-needed bye week this weekend. The Tigers were off this weekend following their 23-9 victory over Auburn. Playing in Death Valley this weekend will be a tough task for them. Quarterback Nick Fitzgerald has only thrown for four scores so far and has three interceptions to go along with that. The Gamecocks attempt at a comeback came just short against Texas A&M. Jake Bentley threw for 223 yards and three touchdowns but his team only had 76 total yards on the ground. You can’t really fault the Tigers for struggling with Alabama. Pretty much everyone else has too. The Crimson Tide defense limited Drew Lock to 13 completions for 142 yards and also forced him into two picks. Missouri is 0-3 in conference play so far and seem to be well below the top SEC East teams: Georgia, Florida, and Kentucky. The Rebels won the battle between the two worst teams in the SEC West as they beat Arkansas 37-33. Jordan Ta’amu had another solid performance, throwing for 387 yards and two scores. The offense can score with almost anybody but the Rebel defense still has not shown that they can stop anyone. The Volunteers got perhaps the most surprising victory of the week in their defeat of Auburn. It’s hard to tell whether this win is more from improvement by Tennessee or from the fact that Auburn is just flat out not a good football team. Either way, it is still a big win for first-year coach Jeremy Pruitt and it snapped an eleven-game SEC losing streak. The Commodores were disappointing again this weekend. Early on, it seemed as if Vanderbilt might just pull off the unthinkable: an upset of 14th ranked Florida. But the Gators came storming back, scoring 24 unanswered at one point. The game might have looked different if star running back Ke’Shawn Vaughn did not leave the game early with an injury. Vaughn had 56 yards on the ground in addition to a 75 yard touchdown reception in the first half. The Commodores need to get back to involving Kalija Lipscomb as well, as he had just four receptions for 64 yards. Arkansas could not take advantage of what might be their easiest SEC game on the schedule. The Razorbacks are 1-6 on the season and have losses against North Texas and Colorado State. They will get another opportunity to get a win when they play 1-5 Tulsa on Saturday.